If you’re thinking of working with carbon fiber this guide should be a big help. The example is aimed at the automotive crowd but the principles transfer quite easily. Carbon fiber parts are constructed in a similar manner as fiberglass parts. A mold is covered in a release agent, the fibers are put in place and covered in epoxy. With fiberglass the fibers are often sprayed on but carbon fiber components use woven mats of the material to build up multiple layers. Vacuum bags are used to hold the layers together, removing air and impregnating the fibers with the epoxy. This guide even outlines the construction of a vacuum pump needed for that step. The benefits of carbon fiber are many, including strength and weight reduction. This makes it a great material for adding parts to weight-sensitive hacks such as quadcopters. But the mesh also has an interesting look which is why it shows up in custom electronics cases. The one real drawback is that when this material fails it is a catastrophic failure, tending to crumble across the entire structure rather than limiting damage to a small area. That means that a rough landing might be the end of your new parts. Catastrophic failure is an issue? You can use something like a thin cord between layers. It doesn’t add much weight and greatly increases rigidity in the part. @fluidic – that doesn’t stop it (the windshield) shattering into fragments, it just holds all the fragments together, in one large mat. Kevlar is an alternative to CF. Not as stiff and strong but tougher and better able to absorb impact. You can layer Kevlar with CF to get the benefits of both. There are also Kevlar/CF hybrid fabrics (fabric made with alternating yarns of Kevlar and CF) but those don’t work as well as a well-designed mix of layers of the individual fabrics. Just don’t assume that Kevlar reinforced resin or epoxy is bullet proof. Another, cheaper alternative to CF is basalt fiber. Stronger than fiberglass but not as good as CF or Kevlar. It has a dark grey to kinda greenish cast rather than the charcoal look of CF. kevlar should not be stated as an alternative to carbon fiber. Rather it has a diferent purpose or use as a laminate. Catastrophic is the failure mode for most composites. It is just the way it is. Now if you make a material with the strength of carbon fiber the failure mode of steel, and the heat resistance of ceramic you would be a very rich person. How about an engineered shelled vertebrate which builds a composite substrate which is a silicon-crystaline “lattice” with layers of randomly interspersed enhancer materials, CF loose-weave honeycombing the crystalline lattice, and all of it suspended in an organic insulation/solidification compound? Feed them, and let them build “reefs” of the stuff, then either mill the end product out of it, or you could get fancy and produce a pheromone gossamer shape of final product, and let them grow into said shape in a nutrient-saturated environment. If you integrate a simultaneous reaction to split CO2, the carbon can be used in the growth process as a raw material. The oxygen would be respirated, and re-attached to any unused C atoms, and forced out of the growing tissue. You know, anaerobic environment inside our creature’s extrusion process. We got some basic nano toys figured out, we only would have to start genetically modifying crustaceans on an aggressive research schedule, and we could likely iron out bio-constructed composite building materials in 3-5 years. It’s fairly standard practice to combine CF with kevlar and other materials to improve failure-mode-like properties at the expense of weight and overall thickness. It’s not going to get as good as a metal, but you can prevent it from shattering into pieces. Take any modern-day racecar. Accidents generally result in loose, floppy body panels, not trillions of shards. Any luck with transparent aluminum yet? But seriously, I await with baited breath the exciting news stories about the mostly-composite designs being passed around by Airbus and Boeing. 15 years from now, quite a few air carriers will be complaining about how mean it was for the FAA to cut the max airframe lifetime estimates and number of pressurization cycles in half. Progress always has a hitch or two in store, it seems. I made a bunch of carbon fiber things in my college dorm room (its where my xbox live handle – Carbonnnnnnnnn – came from). Its fun and pretty easy, but remember, those fumes are toxic! Do it in a well ventilated area and use a respirator. I spent the first couple weeks trying to cheap out and not use one, and I did it all in my little dorm room. Eventually i got the symptoms of overexposure, which are creepy – random dizzyness hours after exposure or even the next day. Eventually it can really harm your brain. I slowed down and spent the $30 on a respirator after that! And if you live near a TAP Plastics – go get materials from them and they can tell you all about the basics. It was helpful. Also remember that it’s conductive, and if you try to machine the finished carbon the fumes are extremely toxic. @andrew A catastrophic failure doesn’t mean shatter. A floppy car tub is pretty catastrophic. With most metal structures you will get cranks or bending and finally a catastrophic failure. The failure tends to be gradual with most composite structures it tends to be all or nothing. Of course you can blend material, make it a lot stronger than it needs to be, and our use have a core that helps but really once a composite starts to fail it fails fast. You just have to work with it most of the time. For a race car tub you set it up so different layers of the tub fail at ever increasing stress levels. AKA crush zones. The other problem with composite construction is that none destructive testing has traditionally been very difficult. I kept up with what Boeing and Lockheed can do but it used to be a real problem. But the great thing about Carbon Fiber is that it is so light. Just make the part a lot stronger than it needs to be and you will be golden. For something like a quadcoptor I doubt that you could find carbon fiber thin enough to be less than several times stronger than needed. Just remember if you crash it hard enough you will have to make a new part and not just bend it back into shape. The other downside is that epoxy resin almost invariability contains Bisphenol A (BPA). Fantastic material properties wise though. But potentially not so nice to get too cozy with so to speak. It comes in sheets and you form it by applying heat using a heat gun or oven. epoxy is bad, my grand father built a small boat one summer, the next summer he was epoxy sensitive resulting in a really bad rash that stuck for days after each contact with epoxy. Don’t get me wrong, everyone should have carbon fiber, vacuum bags and resin at home. With out an autoclave the parts are not going to be of a high quality. its lots of work, but really looks nice and the weight is much lower than the frame i had before. Nice frame! Whats the diameter of frame, Say motor to motor and what did it weigh? – Grain direction counts in structural parts. If you rotate the weave by 45 degrees every time you add a new layer, you gain significant strength increases. – Tape joints are your friend, if they’re done right. If they are not done right, they are your worst enemy. Basically they consist of wetting a strip of carbon, and laying it along a joint such as a planar intersection for a chassis build. – if you cut, say, a couple notches out of the carbon panel, you lose a whole lot of strength inbetween those two notches. The strength of carbon comes from the tensile strength of the fibers, and if you introduce a break in the line of fibers, it’s worthless for a good portion surrounding that cut. There is still some strength, but reinforcement in that area (hence the tape joints) is always a good idea. And contrary to what Mark said, an autoclave is not necessary. In a lot of cases, certain mold materials can’t take high heat (the 16lb/ft^3 high density foam we use at solar cannot be used in “cooked” molds). It all depends on the resin you use. For a non-heated mold/carbon setup, use a long cure resin, i.e. 24 hour setup time or something. I was looking into the feasibility of one-man carbon fiber projects when I cam across this guide. After reading this I have determined that it is considerably more work than I expected (I suppose I thought it would be more like fiberglass, which is relatively easy to work with), but it is an excellent resource for anyone with the patience to take it on. As my name hints I am an aircraft mechanic. Save mess and time with prepreg fabric. prepreg comes pre-impregnated with just the right amount of epoxy. No more fighting with large tubs of epoxy and dripping everywhere. Contact your local chapter of the EAA if there is one. The Experimental Aircraft Association (EAA) is a group dedicated to building experimental aircraft among other things. Many of the newer models of experimental aircraft are composite. You can learn lots from them and they may even know of used equipment for rent/sale (like vacuum bagging equipment). fabric has a warp and a woof. Woof is the strands of fiber that goes across the narrow dimension of the fabric and woof goes the long way. Out another way, the warp wraps around the roll and the woof goes parallel with it. when making your lay up rotate the layers so that the warp is not all going in the same direction. Nomex honeycomb dramatically increases the rigidity of the layup while keeping the weight down. The difference is flat out amazing. If you can accommodate the thickness and want the lighter weight, give Nomex honeycomb your full consideration. The poor mans substitute is corrugated cardboard, which once saturated with epoxy becomes very strong as well (not human rated though). Aluminum and carbon fiber are not friends. If in direct contact and in the presence of an electrolyte corrosion will occur. This can be prevented by coating your aluminum with an epoxy primer and paint, adding an external layer of thing stren cloth (very thin and transparent fiberglass) and using stainless steel bushings and hardware for the connection. Composites generally do not like expansion type fasteners like rivets (including pop rivets and cherry max). Carbon fiber conducts enough electricity to give you a bad day. And the dust produced from most sanding/grinding on composites is hazardous. Some epoxy products are UV sensitive and will degrade in sunlight. Others have an additive that can mitigate/eliminate this. If painting the composite does not bother you (VERY good idea btw) then use a white that has titanium dioxide in it so as to (a) block the UV and (b) keep the composite lay up cooler in the sun and therefore stronger and longer lasting. Cosmetic defects in non critical parts can be filled with a mixture of a thixotropic agent and epoxy. This will allow the voids to be filled and then sanded to final contour. Glass balloons mixed with your epoxy is one way to do this. If you can find it, ceramic fiber can be interesting. Biggest thing this guide missed is to LAY OUT YOUR VACUUM BAG IN ADVANCE! For a flat part you can get away with doing it on the spot, but once you get into complex curves you *need* to add in pleats and extra bag to get into deep spots. And don’t use carbon fibre near anything you want to electrically insulate (like battery packs). Making solar cars teaches you this very quickly! Check out http://cozybuilders.org/my_cozy.html. No prepreg, vacuum bagging or anything. Carbon fiber has advantages, and disadvantages, but plain old E glass is easy to work with and can provide an easy alternative to almost any other building material. Simple hand tools are all that are necessary. Shop knife is the #1 tool, scissors and maybe a dremel will allow you build almost anything. http://wicksaircraft.com has a whole section on composite material. (aircraft spruce does too if you live in California). Foam cores are simpler and cheaper than nomex. For engineering types the book by Andrew Marshall is the bible http://www.actechbooks.com/products/act072/ It covers everything from various resins, and fibers. Peel strength and sheer. If you are desgining something composite, that is the book to have! Watch chemicals, use protection around resin (polyester and epoxy, both can be dangerous). Don’t mess with MEK or vinegar to clean skin, don’t get resin on you, and you will be building for years! I’ve build boats and airplanes, and love fiberglass building. For most composite aircraft construction, the core material is some kind of foam, or honeycomb materials. The foam can be of many types (not the nasty bead board that crumbles), urethane, polyurethane and many others. Look at places like Wicks.com for all the different types of foam. Thanks Tom for your Input. list of materials that are used both in skin and stiffeners of wings. since these are under research most of details are unknown….. I have a question regarding the composite parts which can be easily made using the molds. I do have a mold for a particular aerodynamic part, but I do not want to use pre-preg carbon fibre for testing. Are there any other materials which we can use to make the part using that mold? 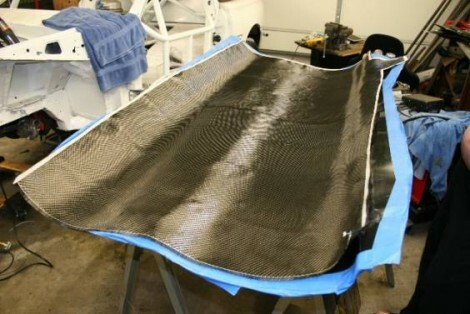 Sure, Carbon Fiber cloth is available from many sources, including Wicks Aircraft and Aircraft Spruce. Get the cloth and wet it out using epoxy. Carefully squeegee the epoxy into all the corners, and you should have a nice part. Is there a different process for making a more structural carbon fiber piece than the process for making a standard shape that is not required to be load/stress bearing? What is the purpose of vacuum bagging the part and baking the part opposed to just hand rolling and curing the resin at room temperature? Non stress/load bearing is probably overkill to use carbon fiber. Structural parts need to be clean, and probably have some kind of core. Vacuum bagging will allow minimal epoxy content (weight) for the part. Hand squeegeeing can get you close for most flat parts. Baking the resin can help give a higher Tg, but it depends on the resin chosen, and the needed strength. Most resins that hobbyists would use (West, Aeropoxy, MGS, etc) will be fine at room temperature cure. Additional strength can be added by post curing. Check http://www.actechbooks.com/products/act072/ for all the details about building with composites.